Pygmy mice tend to be either super easy or really difficult to breed and maintain. We found that we need to establish at least double the amount of colonies that we wanted to breed to ensure that we would hit our target production. Some colonies produced amazingly well and other colonies didn't raise a single baby. You can still occasionally find them in privately owned pet stores, exotic auctions, or listed by hobby breeders. Many exotic breeders, like ourselves, have chosen to stop breeding these critters because the costs of producing these animals (food, space, and labor) are higher than what the average pet buyer is willing to pay. Another challenge that breeders face is finding unrelated breeding stock. It is quite common for many animals in a given geographical area to all be related. The cost of bringing in new bloodlines (airline is the only legal way to ship mammals) is prohibitive to most breeders especially when compared to the typical retail value of these animals. We predict that these critters will also become harder and harder to find as fewer and fewer bloodlines become unavailable. I use glass aquariums to house my pygmy mice. A tight fitting lid is absolutely necessary since most pygmy mice can jump at least nine inches straight up. Even though the pygmy mice are very small don’t underestimate their jumping capabilities. They can also squeeze through very small spaces so thoroughly check out their cage before you put them into their new home. I would not use any Habitrail or other plastic tubes and tunnels as their primary enclosure. They can and will chew through plastic. The tubes and tunnels inside an aquarium would be a way to safely watch the mice explore their surroundings and still keep them contained. Pygmy mice MUST have a lid on their enclosure. I have seen them jump straight up in the air as high as 18 inches. I don’t think there is an easy way to catch an escaped pygmy mouse. The only way I know is to put their favorite food in the bottom of a 5 gallon bucket. Put the bucket next to something they can climb on or make a ramp up to the bucket with books. Hopefully they will jump down in the bucket to get their food and then not be able to get out. Accessories can include clay flowerpots, toilet paper tubes, and other objects to hide in and they will hide! I put a small mouse exercise wheel in with some of my pygmy mice and they were able to make it move. There is enough room on a small wheel for quite a few pygmy mice to play together. I have tried many types of bedding including: Swheat Scoop kitty litter, pine shavings, aspen pellets, corn cob bedding, recycled newspaper pellets, Cell-Sorb and more. Out of everything I have tried I like Care Fresh recycled newspaper the best. If you want to watch your mice you will want to use only a small amount of bedding. However, they love deep bedding to burrow and tunnel. Never use cedar shavings because the oils and dust from cedar can be harmful to small mammals. I seem to have the best results using a variety of different types of food. The main part of the diet is a finch or parakeet seed mix. To that I add small amounts of dried fruit and nuts, sunflower seeds, kitten food, fresh fruits and vegetables, rodent block, monkey biscuits, and more. I like to give them a variety and then they eat a little bit of everything. Fresh water is a must. I have tried several types of watering devices including glass sipper tubes and 2oz bird bottles with a metal tip. I prefer to use a water bowl the best. I set the water bowl on a small section of a 2"x 4" piece of lumber. It adds some height to the bowl so that the bedding and food doesn’t get into it as much as if it were sitting on the bottom of the cage. I use the very small water bowls and then I put several small rocks in it so if they fall in they can get out. Before I started putting the rocks in the bowl I found a couple of drowned babies in their bowl. I have had much better luck raising babies using bottled water rather than tap water. Keep your pygmy mice out of drafts. A comfortable temperature is 70° F to 80° F. I give them pieces of tissue or shredded paper that they can use to make a nest. It is not good to stress the little guys out by making them run spastically around their cage. When they bounce off the walls of their cage it affects them the same way a car accident would effect us. When I need to change cages or handle the pygmy mice I work with them in the bathtub! That way, if they get loose I have a good chance of catching them. Be careful catching loose mice - they can squish very easily L .
Day old pinkies are the length of a pencil eraser. (Cragg, Peter). When I have had adult pygmy mice bite me it has never broken the skin. 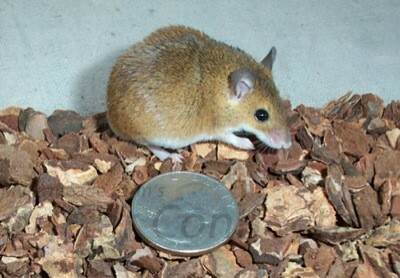 Pygmy mice can start reproducing about six weeks of age. Care and Feeding of the African Pigmy Mouse. Peter Cragg DVM. Http://www.kingsnake.com/critter/others/micepigy.htm. Small Exotic Mammals A-Z. Pat Storer. R-Zu-2-U. Country Storer Enterprises. P.O. Box 160. Columbus, TX, 78934.